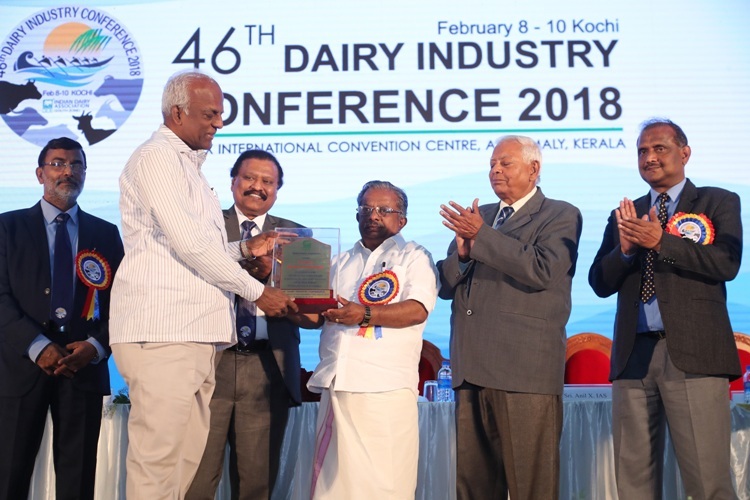 Mr.RG.Chandramogan, Chairman and MD, Hatsun Agro Product Ltd. has been awarded the most prestigious ‘Patronship’ award by Indian Dairy Association in recognition of his outstanding services rendered in furthering the growth of the Indian Dairy Industry and the cause of Indian Dairy Association. The citation reads “This patronship is a fitting tribute to Shri. RG Chandramogan for his exemplary role in the development of the dairy industry and his numerous contributions, to its progress.” The award was given at the 46th Dairy Industry Conference which took place in Kochi. The accolade is awarded annually to a person with outstanding academic or professional achievements in dairy science and technology. The individual should have rendered service to the cause of dairy development for a significant number of years. Mr. RG. Chandramoganholds the distinction of being the first individual from private sector dairy to receive this honour. Hatsun Agro Product Ltd. Is a leading private sector dairy player in India. HAP procures milk from select fine quality cattle collected directly from over 4,00,000 farmers, chosen with care. HAP follows quality standards certified by the prestigious ISO 22000 and is engaged in producing and marketing - Arun Icecreams– South Indias leading ice cream brand, Arokya Milk – the country’s largest private sector milk brand, Hatsun Dairy Products – a rapidly growing, wide portfolio brand of dairy products, Ibaco – Premium chain of ice cream outlets enabling consumers create their own ice cream sundaes& Santosa – a fast growing cattle feed brand. HAPs products are exported to 38 countries around the world.